It’s More Than “Just Right” Just One Mile From Stowe Resort. Tucked in the woods, this is a cozy cabin. No bears, too! In Stowe, Vermont, a stone’s throw from world class downhill and cross country skiing sits quintessentially rustic Goldilock’s Cottage, welcoming overnight guests. When Jill Evarts purchased the cabin and four acres of land about twelve years ago, she didn’t need to do a lot of work on it. 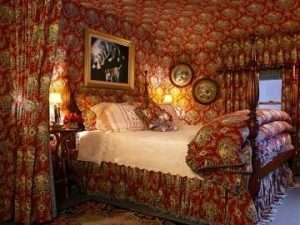 She had helped the previous owner, a friend and colleague, decorate it with fine fabrics and purchases from flea markets and antique shops all over the northeast. 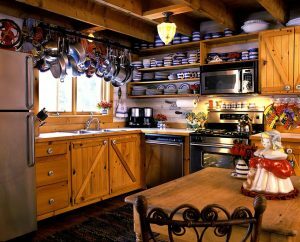 The cottage is clean and tidy with many amenities that appeal to eye and requirement for comfort. I found the cottage warm and inviting far beyond the “just right” of the fairy tale. The kitchen is well equipped, and I was able to easily prepare a pasta primavera for dinner. It has the right pots and pans and cooking implements for cooking lots of delicious meals. 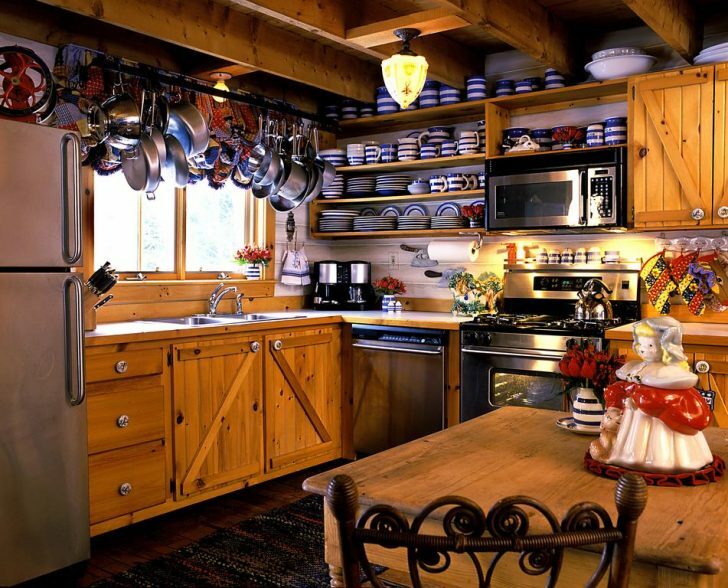 There is even a small spice rack above the stove. The kitchen/dining area was immaculate and comfortable. The kitchen has everything you need, bring our own porridge. The living area of the open concept cottage was equally welcoming with a wood burning stove in the center. Plenty of seasoned firewood makes using the wood stove quick and easy. The cottage has one bathroom which is also decorated in the theme of the rest of the cottage and I found it clean and complete with all the towels you’ll need. The Master bedroom, complete with a sitting area and sleep sofa, also have an interior decorator’s touch. . The cottage has a spacious deck off the bedroom and a deck accessible from the dining room complete with Adirondack chairs and a gas grill. Those details make the cottage appealing year round. 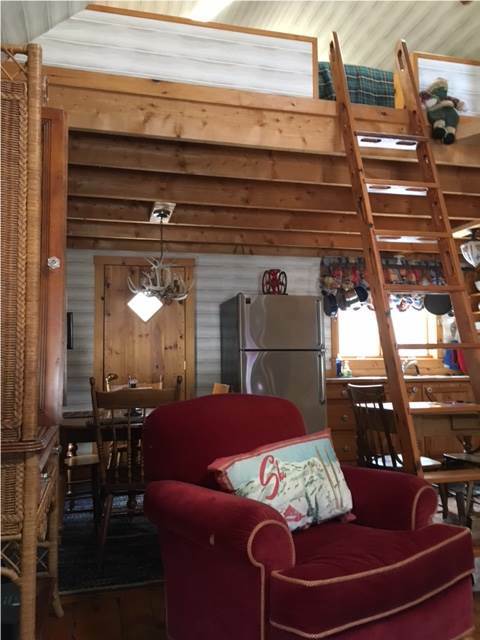 Bears can’t climb ladders to the loft. Everything you may want or need seems to be taken care of. Jill agrees that this attention to detail makes her place perfect for active seniors who want a winter (or any other season) getaway. The area does come alive in winter however because of the outdoor sports, great restaurants and shopping. 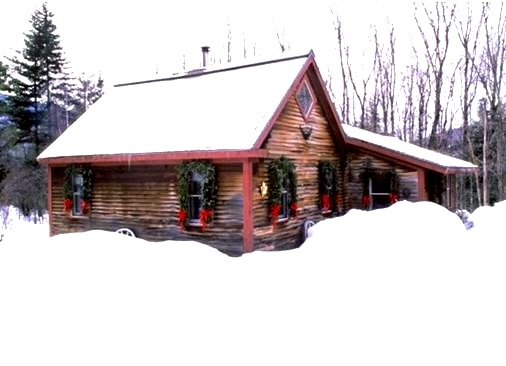 The cottage is close to Stowe and the location makes it easy to get to the Alpine and Nordic skiing. The rest of the year the Mount Mansfield locale has great hiking, cycling, mountain biking. The many fine restaurants in and near Stowe make dining out a pleasure as well. While I’m not a fan of grading accommodations, you might like to know I give Goldilocks’s cottage an A+. For more details about dates, rates, and availability, visit the cottage’s web site here. Ski season rates start at $250 per night (March) and $270 (Feb). Holidays are more. The cabin can accommodate up to five folks in one bedroom, a sleeping loft and a pull-out couch. Here’s the Master Bedroom, ultimate cozy.